Endoscopic stents have been demonstrated to be safe and effective in treating complication of upper gastrointestinal surgery. However, stents placed tend to be unstable and have a significant rate of migration. It is unclear what factors influence stent stability and the ideal clinical application of this technology. 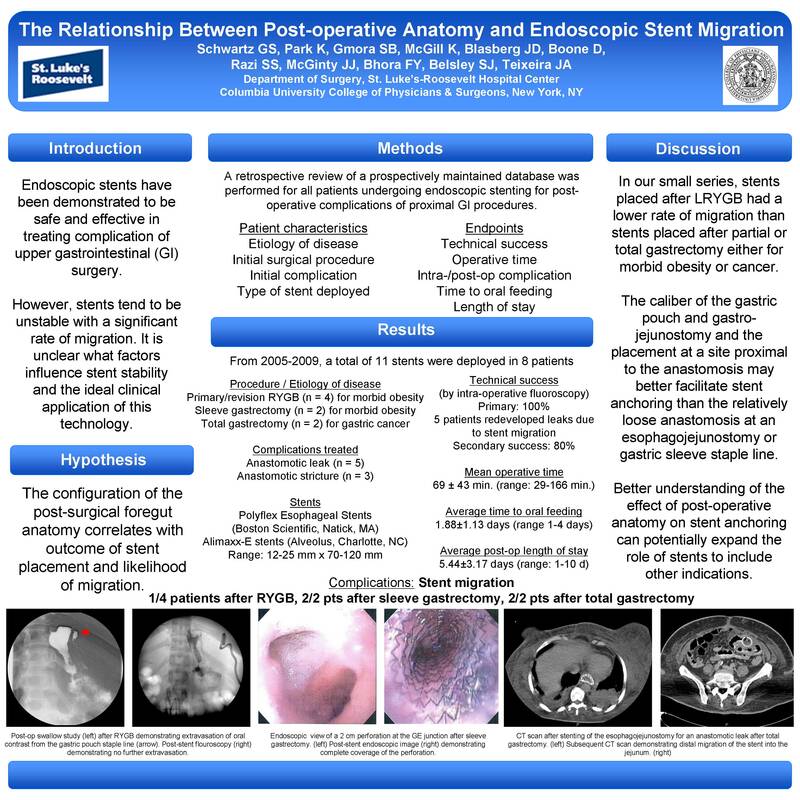 We hypothesize that the shape of the post-surgical foregut anatomy will correlate with outcome and likelihood of migration. A retrospective review of a prospectively maintained database was performed for all patients undergoing endoscopic stenting for post-operative complications of proximal anastomotic leak or stricture. Patients were assessed for etiology of disease, type of initial surgical procedure, location of complication, and type of stent deployed. Endpoints were technical success, operative time, intra- or post-operative complication, time to oral feeding, and length of stay. From July 2005 to July 2009, a total of 11 stents were deployed in 8 patients. Etiology of disease and types of procedure included: (1) morbidly obese patients who had undergone primary or revision roux-en-Y gastric bypass (RYGB, n = 4) or sleeve gastrectomy (n = 2) and (2) gastric cancer patients who had undergone total gastrectomy with esophagojejunostomy (n = 2), including one patient that had adjuvant external beam radiation. Complications that were treated included anastomotic leak (n = 5) and stricture (n = 3). Stents placed were Polyflex Esophageal Stents (Boston Scientific, Natcik, MA) and Alimaxx-E stents (Alveolus, Charlotte, MC) ranging from 12-25 mm wide and 70-120 mm long. Mean operative time was 69 ± 43 minutes (range: 29-166 minutes). There were no perioperative complications other than stent migration. Primary technical success as evaluated by intra-operative fluoroscopy was achieved in all cases, although 5 patients redeveloped leaks due to stent migration; secondary success after stent repositioning or replacement was 88% (7/8 patients). Stent migration occurred in 1/4 patients after RYGB, 2/2 patients after sleeve gastrectomy, and 2/2 patients after total gastrectomy. Average time to oral feeding was 1.88 ± 1.13 days (range 1-4 days) and average post-operative length of stay was 5.44 ± 3.17 days (range: 1-10 days), although a single patient with severe complications from the initial operation never tolerated oral intake and expired in the hospital. The utility of endoscopic stenting for the management of post-operative leaks and strictures after foregut surgery has been well demonstrated, with a known high rate of migration. In our small series, stents placed after RYGB had a lower rate of migration than stents placed after partial or total gastrectomy either for morbid obesity or cancer. The caliber of the gastric pouch and gastrojejunostomy andplacement proximal to the anastamosis may better facilitate stent anchoring than the relatively loose anastamosis at the esophagojejunostomy and gastric sleeve staple line. Better understanding of the effect of anatomy on stent anchoring can potentially expand the role of stents to include other indications.